January 8, 2019, the news was focused on one thing. The Big. Dangerous. Waves. Of course, we realize they have good intentions. They want to warn all the people that normally don't even acknowledge the ocean's existence, that tomorrow the waves are gonna be a real spectacle. So the next day, all the beaches are packed with lookie loos. And the lineups are packed with surfers. Now, most surfers probably would have known about the incoming swell without Phillip Man and his Eyewitness News Team. But having all the media coverage invites a lot of otherwise oblivious individuals into the picture. Nice, healthy kids lookin' for a good time. 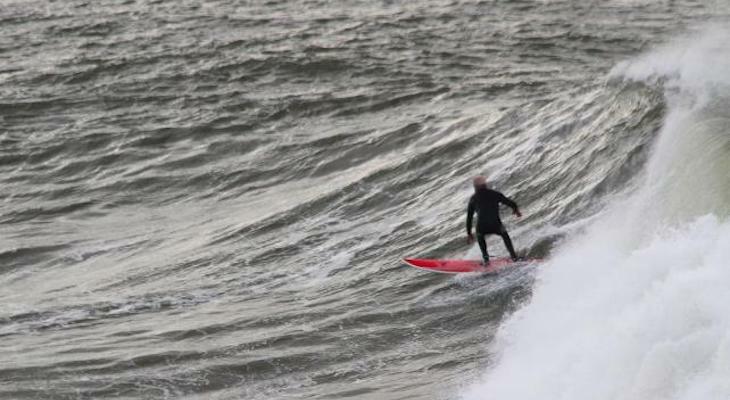 But maybe they don't always have all the tools required to surf the biggest waves of the year. Things like knowledge, experience, a real surfboard, and a respect for Mother Ocean. But it's all the talk around town and all their friends are going and they want to be cool too and how dangerous can it really be anyways? So then the first responders get called out to do their job and voila! The news team has another big story to cover. Meanwhile, real surfers were observing conditions and making a plan to safely enjoy the unusual surfing event. The fun thing about big days is that waves break everywhere. Fat, dirty, slabs were breaking at Goleta Beach. Or what was formerly Goleta Beach, RIP. Every spot looked different, depending on wind and tides. Some breaks looked inviting. Other spots made me happy to be a photographer. And if the oceans really do rise and storms keep happening more often and stronger, will the airport be moved and our new airport bldng get retrofitted to be a marina or will everything built on what is landfill over a swamp just sink? Our own Atlantis. So will the Beachside Restaurant end up in a cofferdam structure like the ones in the Netherlands used to drain & pump water from an area below sea level so structures can be repaired? Will we get there by punt, canoe, raft, gondola or some other picturesque form of water transportation and take an elevator or ladder down or will it get washed away? I'm not a ocean goer, but I had no idea about the condition of the beach there. Does this mean that the waves are really, if not too close to the restaurant now? 8' west at I V breaks next sat.